Flying under the radar since the 1950s in the world of Texas barbecue is tricky business. With the advent of the modern era of food bloggers, facebookers, myspacers and twitterers, it’s difficult to keep your business reserved for the cognoscenti. But Davila’s Barbecue, down in Guadalupe County, has managed to pretty much stay off the radar for the last half century or so. I come here for handmade sausage; some of the finest I’ve ever had in Texas. A recent visit also found the brisket to have made significant gains in quality. Both meats were Lockhart quality and I do not say that lightly. 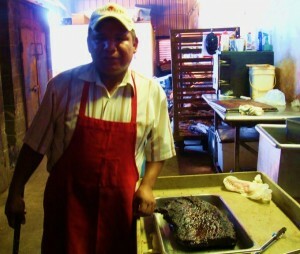 Pictured is Geraldo, the pit boss at Davila’s #2, it’s still called the new location in spite of having been in operation for 12 years. The original sits downtown where smoke has been rolling off the pits since 1959. I noted a Davila’s barbecue truck in the parking lot of the new store on a recent visit. It set me to thinking about how Austin would react to having a second barbecue joint in town doing sausage from scratch [the first being John Mueller]. Something tells me the Bohunks, Germans and force-meat fanatics around these parts would embrace this notion. This entry was posted in Rural Texas, Texas Barbecue, Texas Barbecue Photos and tagged barbecue, BBQ, best barbecue, Brisket, central Texas hot guts, Pork Ribs, sausage, scratch tortilla. Bookmark the permalink.